Yes, it's sunny in Khao Lak too! The good weather in Phuket continues as expected. No excitement to report... But who's complaining? Not me! It has been a little bit hazy over the last few days, and there have actually been some small waves at the beaches - this being the last trace of the South West monsoon. The BBC reported that the final monsoon rains had gone from SW India a few days ago, and so now we can expect really calm beaches and a steady North East wind starting to blow, keeping temperatures a bit lower - maximum might struggle to hit 30°C! Chilly! Thinking of staying in Khao Lak? 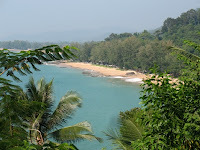 See Khao Lak Hotels.